I go to Bar Method classes regularly and I've been keeping up the healthy lifestyle habits I developed while prepping for our wedding: eating healthier, drinking more water, sleeping more, and paying attention to self-care. 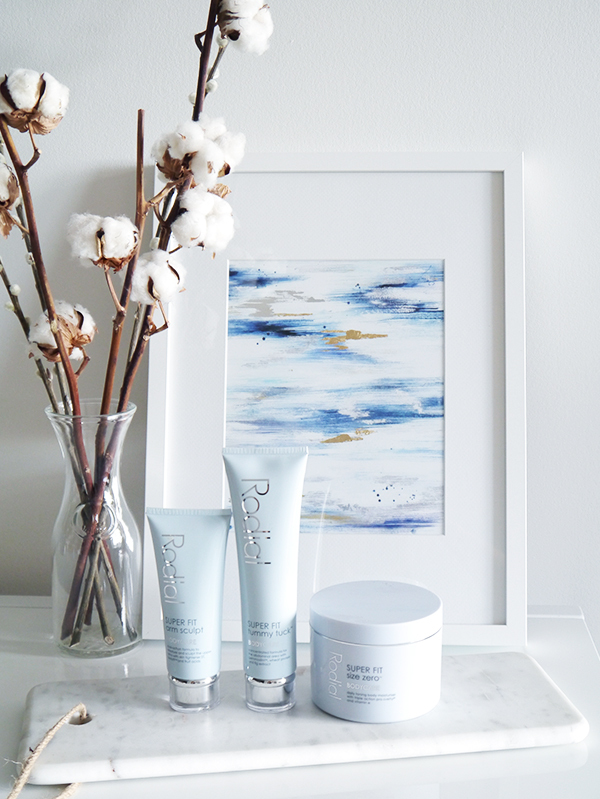 But sometimes good habits aren't enough, which is why I was curious about slimming and toning lotions and potions like those by Rodial Super Fit Bodycare (available at Shoppers Drug Mart nationwide). Do they really work? All the details after the jump! Rodial Super Fit Bodycare promises to tone and retexture skin while slimming you down and giving you a more sculpted appearance. Unlike other slimming creams which use caffeine to energize the skin and get rid of bloat, these formulas boast trademarked complexes like "triple action pro-sveltyl," "skin tightener ST," and "bodyfit" as well as exotic-sounding natural ingredients. These creams sound like a miracle workout-in-a-tube, but they are not a substitute for proper diet and exercise. Rather, they act on the surface of the skin, cooling and tightening and smoothing it, to achieve superficial, temporary results. 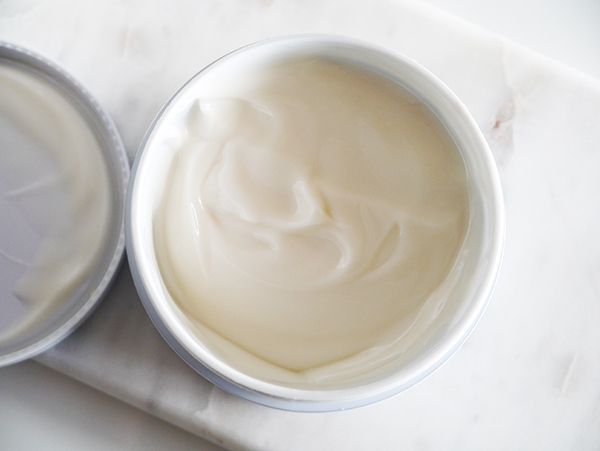 Once you stop using these creams, the benefits stop too. If you've noticed your skin and limbs aren't as taut and toned as they were in your twenties, or you're prone to episodic bloating like I am in hot weather, Rodial Super Fit Bodycare may be the extra oomph you need to bare skin during the summer with confidence. Rodial's tagline is: "In the age of chemical peels and cosmetic surgery, Rodial has captured nature's power by creating a range of super-effective skincare. Rodial products deliver targeted solutions to specific skin concerns." Despite the natural-leaning marketing-speak though, this is not a natural bodycare line. The formulas rely on a cocktail of chemical ingredients to achieve the cosmetic benefits that the products promise and the natural ingredients touted on the front of the packaging often appear halfway down the ingredients list, indicating a relatively lower concentration. One ingredient that appears in all three products, cyclopentasiloxane, has been classified as expected to be toxic or harmful by Environment Canada and shown to be persistent and bio-accumulative, and linked to increased risks for cancer, endocrine disruption, and neurotoxicity at moderate doses, according to the EWG Skin Deep Database. Yikes. 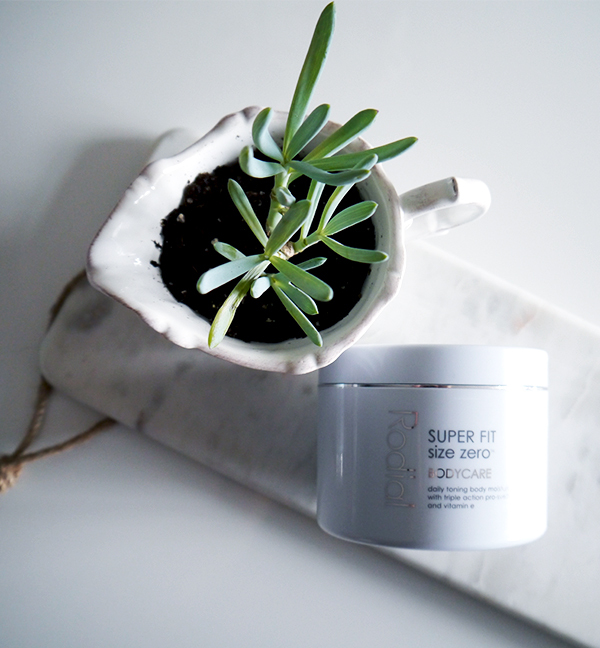 If you're a green beauty devotee who believes everything you slather on skin is absorbed directly into the bloodstream, you might want to skip Rodial Super Fit Bodycare. However, as I noted in my post about my journey into green beauty, that belief just isn't true scientifically speaking. And as someone whose approach to skincare is more natural(-ish) than 100% #cleanbeauty, I was still open to trying the line despite some misgivings about certain ingredients. 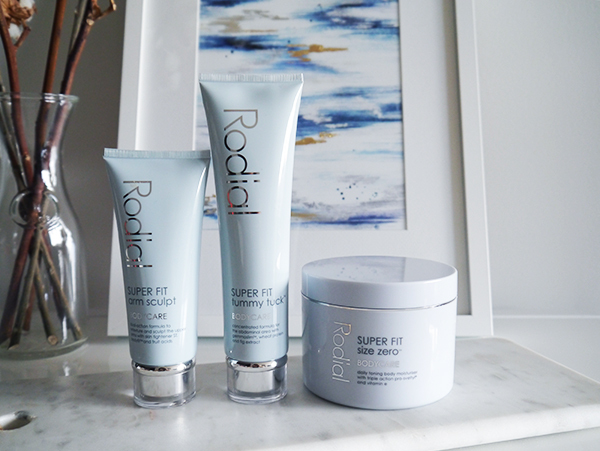 Here are my thoughts on each of the Rodial Super Fit Bodycare products I tested on and off over the last few weeks. 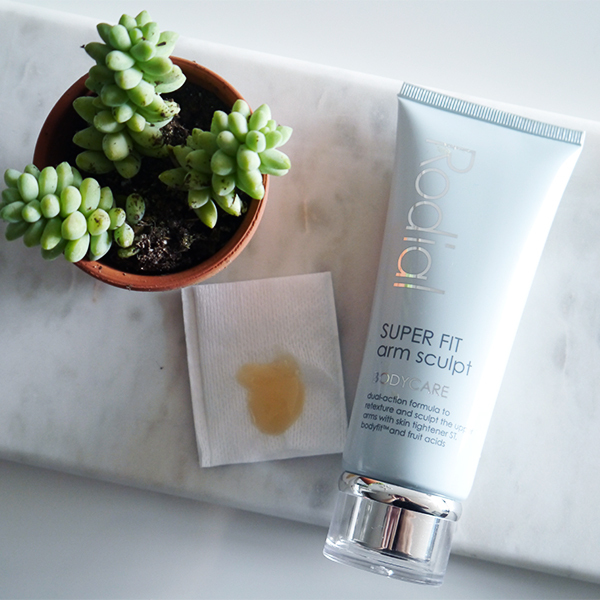 Rodial Super Fit Arm Sculpt Bodycare ($62 at Shoppers Drug Mart) has a dual-action formula that promises to retexture skin with fruit acids and sculpt upper arms with skin tightener ST and a trademarked bodyfit complex. The smooth yellowish gel absorbs and dries quickly, and its cool-to-the-touch texture feels like such a treat to apply on hot days. It also has a light herbal scent that fades within half an hour. Arm Sculpt left my upper arms and shoulders feeling smoother and lightly hydrated, and minimized the sort of trapped-under-the-skin, superficial bloating I'm prone to in hot weather. It won't get rid of bat wings, but it did subtly enhance the appearance of the arm muscles I work so hard to cultivate in Bar Method. This would be a great product for special occasions or for bridal parties. In fact, I kind of wish my bridesmaids and I had had this to apply before donning sleeveless dresses on my wedding day. 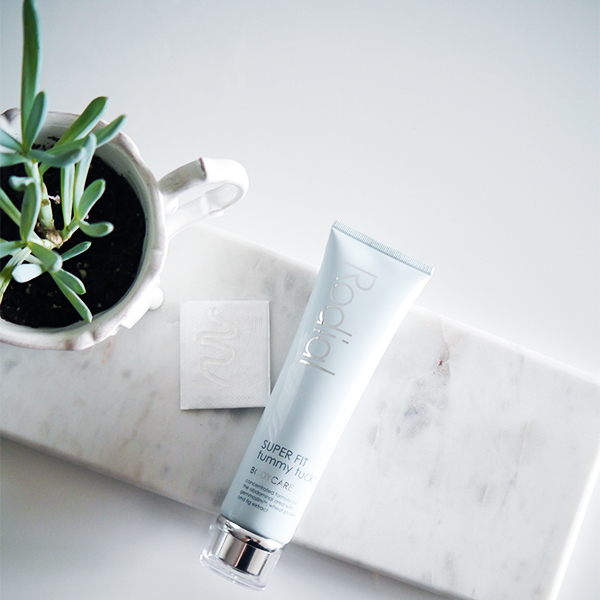 Rodial Super Fit Size Zero Body Care ($68 at Shoppers Drug Mart) features a light whipped texture, and like Arm Sculpt, it's cool to the touch (love this for summertime applications! ), absorbs quickly and has an appealing light herbal scent that fades. You can use Size Zero all over the body, concentrating on problem areas like the thighs, abdomen, and hips, and for the best results the instructions recommend twice daily applications. The 300 ml tub is huge and reminds me of a giant vat of body butter—there's probably more than enough product in there to last the entire season, especially since a little goes a long way. I really liked Size Zero for its lightweight texture as it applies and dries less thickly than Arm Sculpt or Tummy Tuck (which I'm reviewing below), and it subtly but noticeably improved the look of my thighs and calves. If you have to pick one Rodial Super Fit cream to try that can do it all, Size Zero is probably it. To reduce bloating even more, try exfoliating with a detoxifying salt body scrub all over before applying Size Zero. Rodial Super Fit Tummy Tuck Bodycare ($82 at Shoppers Drug Mart) claims to be a "concentrated formula for the abdominal area with gemmoslim, wheat protein and fig extract"; to apply, massage over the abdomen in circular motions until the product is absorbed. Like the other two products, the gel texture is cool to the touch (again, cannot stress enough how amazing this feels on a hot day) and the product absorbs quickly and has a light herbal scent. However, this gel is slightly thicker and gummier to better tighten the skin in the stomach area. Tummy Tuck doesn't make a significant, noticeable difference in your belly's girth; rather, it tightens the skin over the abdomen so it appears tauter and more toned. If you're using this before donning a bikini, I recommend allowing 1-2 hours' drying time so the product has a chance to absorb; otherwise, the gel will end up washing right off as soon as you hit the water. Rodial Super Fit Bodycare is not a workout-in-a-tube despite the miraculous-sounding moniker, but once you adjust your expectations of what it can do, with proper diet and exercise you'll be pleasantly surprised by the results. These cool-to-the-touch gel-textured lotions are a pleasure to apply, and they smooth limbs and skin so you can wear sleeveless tops and shorts with a little extra boost of confidence. Due to the high price points and some misgivings about non-natural ingredients though, I'd probably reserve them for special occasions like weddings and parties, or when I feel like I need a little extra help to fight hot-weather bloating.